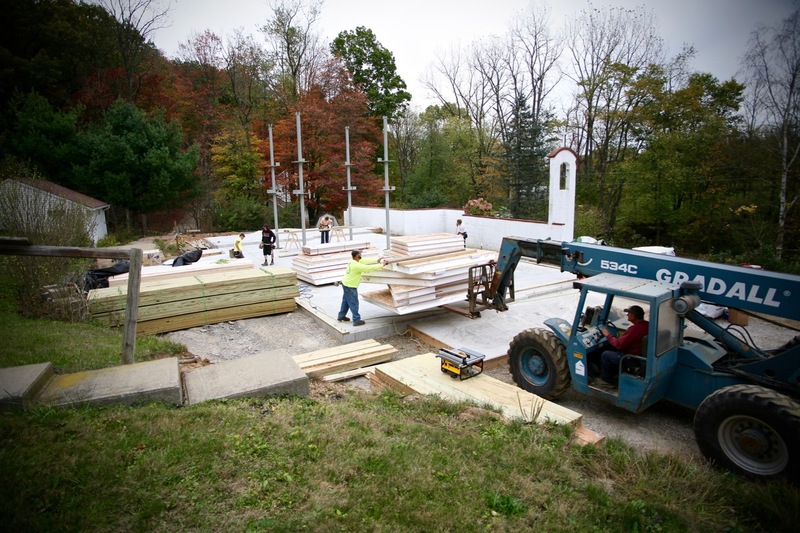 During a return visit last week to St Gregory Palamas Monastery in Hayesville, Ohio, I was able to see the progress on their new chapel, designed by the esteemed Orthodox architect Andrew Gould. You can read about the chapel and see the architect’s renderings here, and view my extensive gallery of images from St Gregory’s here. Delivery of construction panels for the new chapel. Note the four vertical support pillars, which will support the cupola and main roof. The old structure has been removed, and the foundation completed on the existing footprint of the old chapel, with an extension of several feet allowing for a larger nave, narthex and covered porch. Just the week before I arrived, the main pillars had been set in place, and while I was there, a large shipment of panels were delivered. Unfortunately, soon after the panels were unloaded, it began to rain, so the workers had to carefully secure and cover everything in plastic, and retreat to wait for dry weather. So encouraging to see the progress first hand. In the interim, Saturday and Sunday services are being held in the re-purposed trapeza on the upper floor of the St Xenophon Guest House, in which the monastery’s iconostasis fits perfectly, and which makes for an ideal chapel during the construction. I also attended Matins and Liturgy in the brotherhood’s new St Maximos Chapel at the north end of the new monastic quarters, which was still unfinished when I was here three years ago. This beautiful chapel, with high, vaulted ceiling and handsome iconostasis is a welcome enhancement, and a further sign of the growth of this monastery, which currently has seven tonsured monastics and one novice, with, I believe, two candidates currently. 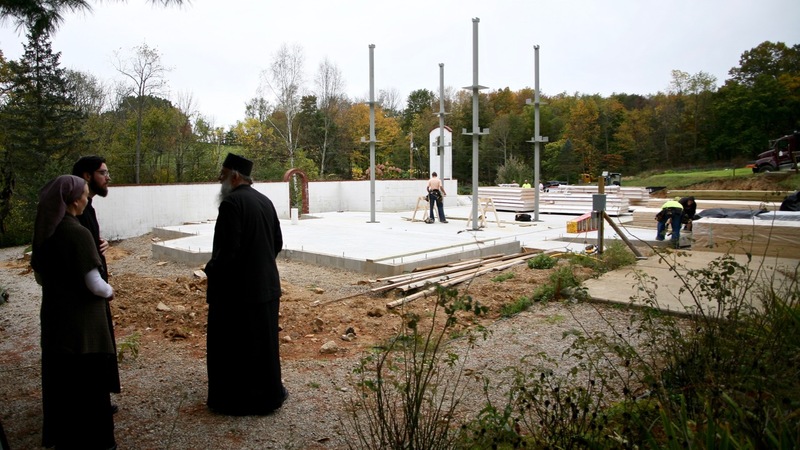 The abbot, Archimandrite Joseph, shows pilgrims the progress on the new chapel. This gives a slightly closer view of the four main pillars.